"Decision To Go Back To The Drawing Board"
Two Fridays ago, after weeks of wrangling over the ever-rising price and gargantuan dimensions of the new National Stadium, Prime Minister Abe Shinzo announced that the Tokyo Olympic effort would abandon the Zara Hadid "bicycle helmet" design in favor of...nothing. Well not exactly nothing. Back to a blank sheet of paper (in J. - hakushi) upon which...someone will drawn up new plans answering...well, actually nobody knows what the criteria are that the new design for the new stadium must meet, only that it cannot cost as much as the Hadid design and has to fit 80,000 spectators, maybe. Oh, and it has to be ready in less than five years. And it might have to keep spectators and athletes from keeling over from heat stroke despite daily shade temperatures of 35 degrees...maybe. That no one to date has taken a fall -- or even personal responsibility -- for the selection of the stadium design has wounded Prime Minister Abe Shinzo and exposed the emptiness of his and his party's promises of bringing professionalism back to Japanese government. The PM directly appointed two very close political allies -- his former faction boss Mori Yoshiro and Member of the House of Representatives Shimomura Hakubun -- to the private and ministerial posts with the greatest influence over the 2020 Olympics project. Push came to shove over the stadium's costs in the inconvenient person of Tokyo Metropolitan Governor Masuzoe Yoichi who balked at the size of Tokyo's share of the final bill. Rather than demonstrating the PM's wisdom in having picked archetypal conservative's conservative men's men, the pair of Abe Best Friends Forever Mori and Shimomura retreated to pre-adolescent pointing of fingers at each other as the one responsible for promoting an unwanted trophy stadium. Oh, yes, and at the looming, terrifying form of architect Ando Tadao, who had led the architectural subcommittee of the wise person's group overseeing the Olympic bid. The unwillingness of anyone of authority to stop the juggernaut of the stadium plan even as project costs and public hatred of the design soared led several critics of the project, including Governor Masuzoe, to draw parallels between the increasingly hopeless stadium project and Japan's march to war in the 1930s and 40s (Link - J). To too many, the constant hot potato passing and failure to confront the situation squarely was like the ever-receding horizon of a final security perimenter toward which the Imperial armies kept marching, marching, marching... with automatic approvals at each step from men with fine titles but without a scintilla of a responsibility or remorse. Not an image one can welcome, not in this 70th anniversary year of the firebombing of Tokyo, the destruction of Japan's cities, the Battle of Okinawa, the nuclear bombings of Hiroshima and Nagasaki, Japan's surrender and the beginning of the Occupation. Not to mention right in the middle of the Diet's consideration of legislation ending a 50 year understanding that collective self defense -- the right to engage in military on behalf of another country anywhere in the world -- is unconstitutional. The person ultimately responsible for this debacle? Prime Minister Abe of course. He appointed these gentlemen (and they are all men) to their posts. He has not to this point managed to eke a resignation out of a single one of them. All of which stimulated Tokyo Shimbun reader Takase to compose the above bitter senryu. The author is seeing the scene as if it being played out upon stage, with the stage hand lifting up and flipping over the paper on which the name of the second act of the drama is written. The new scene has the impressive-sounding all-kanji name of Hakushi Ketsudan ("Decision of the White Sheet"). 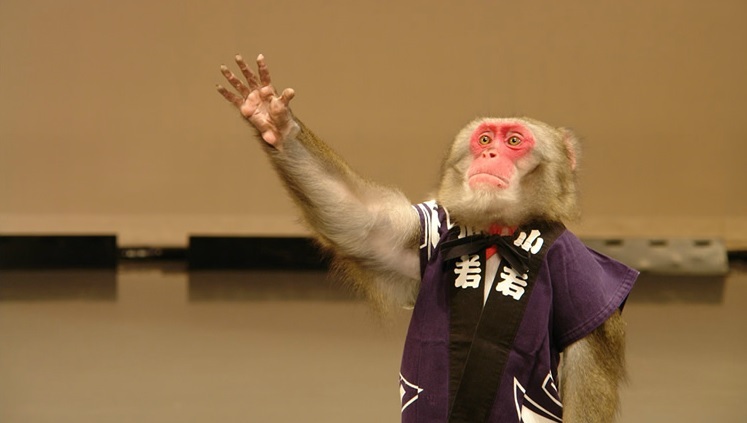 However, looking at the stage, all the author sees are monkeys dressed in kimono, pretending to do a play. It is saru shibai -- "monkey theater." The twist comes in that latter phrase. Saru shibai has a second, derisive meaning of acts done incompetently, pathetically and with all the sense wrung out of them. A proper English colloquialism for saru shibai would be "lame" -- and the performances of every supposed adult in this drama has indeed been lame. And don't even get me started on the selection of the designs for the official logos of the 2020 Olympics and Paralympics. I have elsewhere characterized these fine artistic statements as "Soviet Constructivism beats up Robert Indiana in a dark alleyway." The senryu by Takase Kunio can be found on page 5 of the Saturday, July 25 morning edition of the Tokyo Shimbun. Yes, Welcome back. You were missed. By the way, though, my take on the stadium fiasco is somewhat different. I think that Abe rescued himself by cancelling the insanely stupid beyond words stadium and telling them to start over. If he hadn't, there might have been rioting in the streets, and by putting his foot down, he's shown himself to be the only grownup in the room. Now the Asahi's ranting about the new war powers acts can be written off as the usual left wing squawking, sigh. Also, although Masuzoe was the first bigwig to complain about the insanity, he only complained once. There was a meeting of everyone involved (which Ando couldn't be bothered to attend) at which Masuzoe said absolutely nothing. It was after that that Abe told them to stop being ridiculous. Whatever, your point (in the next post up) about there being no one else and Abe's actual support being very weak is well taken.